We love to create beautiful calligraphy for our bride and grooms and wedding and party planners. 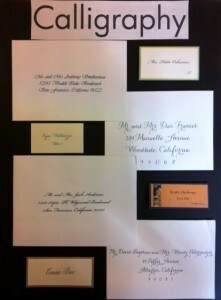 Our clients rave about their gorgeous invitations we have printed using our fast, affordable and elegant calligraphy. They also love how quick, affordable and beautiful their wedding invitation envelope addressing are and they can simply mail off their wedding invitations/announcements to their guests! The Above Calligraphy Sample is in Digital Calligraphy with “Avalon Font” Style. You can see more of our Calligraphy Styles for Wedding Invitations, Wedding Invitation Envelope Addressing, place cards and menus on our Calligraphy Page. 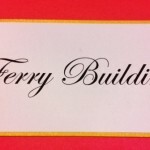 You can also view our Digital Calligraphy Font Styles on our Calligraphy Envelope Addressing Page. We can create all your wedding invitation stationery from the invitations to the invitation envelopes to the rsvp envelopes as well as the return addressing printed on the envelope flap. 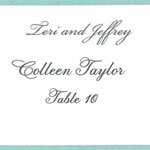 Once your wedding invitations and/or save the dates are mailed out then we can work with you on the place cards, menus, programs, table cards and any other calligraphy and printing your event may require. Please see our happy customers on our Testimonials Page and see our latest works on our Wedding Blog! If you need to order beautiful save the dates and wedding invitations or bridal shower invites please see our Wedding Invitations Page. If you’re not in the San Francisco area you can also check our Wedding Invitation Selections on our ONLINE SITE.